So, you want to check how far the green mamba (SA passport) will get you? The tricks to booking cheap international flights from South Africa are (1) to compare all airline prices using the booking engine on the left, (2) to be flexible regarding your departure and return flight dates, (3) to start planning a year in advance, (4) to be patient and (5) to be prepared to fly indirect flights. Most of the time it pays to book well in advance, but sometimes last minute flights are the cheapest. International airlines usually take bookings a year in advance of their flights. Our readers are our writers! Email us a writeup of an international flight & we'll give you a travel voucher to use to discount against the price of your next flight. We guarantee the best airfares on international flights. Ask for assistance - our travel pro's are itching to help you find the best deal. Spring is a magical time in Europe and seeing the Eiffel Tower peek through beautiful blossoms is pure magic! Now you can experience it with flights from Cape Town to the City of Lights from only R6,610* with Kenya Airways. It is time to brush up on your French. Au revoir! * There was very limited availability when we last checked flight prices, so please navigate through the link in order to see if the featured price has changed. *Note that the prices below may have changed. I am looking at flying from Johannesburg to London on the 16th of November 2014, returning on the 23th of November 2014? What is the best airfare that you can give me? The best airfare I could find was R8,987* with Emirates. When I flew from Johannesburg to New York, it was cheapest to fly with Emirates via Dubai. Emirates, Qatar Airways and Etihad often offer the cheapest flights, even though you first have to stop in the Middle East (Dubai, Doha and Abu Dhabi). For an irregular flyer this provides the opportunity to sight-see (Dubai, for instance, is home to the tallest building in the world, an indoor ski slope, desert safaris and the famous wild wadi; and Doha is going to be the venue of the Fifa World Cup 2022). The most popular international flight route from South Africa is from Johannesburg to London (and Cape Town to London). If you want to fly direct, remember to consider Virgin Atlantic and British Airways in addition to SAA. Because of the fierce competition, it is sometimes cheaper to fly to Europe and the USA via London (and if flying onwards to Europe, Ryanair and easyJet offer cheap onward flights). The most popular international flight routes from South Africa are to London, New York, Atlanta, Paris, Frankfurt, Mumbai, Dubai, Perth, Sydney, Auckland and Singapore. South Africa is becoming better connected with the rest of Africa via low cost airline routes. Fedair flies from Nelspruit and Johannesburg to Vilanculos. 1time airline now flies from Johannesburg to Maputo (Mozambique), Zanzibar (Tanzania) and Livingstone (Zambia, next to Victoria Falls). Comair (through its Kulula, BA & partner brands) flies to Livingstone, Harare (Zimbabwe), Maputo, Lusaka, Mauritius, Windhoek, Ndola, Dar es Salaam and Gaborone (Botswana). Meals on international flights vary widely by airline, by length of flight and by class of ticket. On a low cost carrier flight, like a 1time Johannesburg to Livingstone flight, you'll have to purchase your own food. On a long haul flight with a reputable airline (like Emirates), you'll be able to select meals according to your specific dietary requirements (e.g. vegetarian, non-lactose, low-sodium). The standard and choice of meals for first class passengers is far superior to that for economy class passengers. Some airlines allow you to order cake or champagne at the time of making a reservation. The First class meal menu on an Emirates flight may include cocktails, canapés, caviar, Arabic mezze, tangerine chicken, fresh salad, soup, braised beef, samka harra, glazed duck, aubergine lasagne, vegetables, banana pudding, strawberry cheesecake, an international cheeseboard, fruit, beverages and chocolate. Cramming stax of pax from various places with exotic germs into a metal can for 10 hours is a recipe for getting ill! Recirculated air containing passengers' respiratory viruses may cross into your system, and crossing time zones can throw their circadian rhythm and natural defense mechanisms into dissaray. This may be aggravated by some people's fear of flying, circulation difficulties if you don't move around and the consumption of alcohol. Prevention is better than cure, so wear disposable masks, use antiseptic hand gel, take a flu injection well before you travel, move around and pay for a business class seat to ensure you get your sleep in. When travelling internationally it can be frustrating arriving with the wrong adaptors. Here's a handy resource which lists electrical outlets per country. Get on the right flight - only fly night flights if you manage to sleep on flights. If you can afford it upgrade to premium economy. Pack a neck pillow. You aren't in a fashion show on board planes - wear your most compfortable clothes, don't be afraid to wear your pajamas. If you're too embarassed to walk on the plane in your pj's then put them on when the seatbelt light turns off. Arrive early at the airport to get a seat at the emergency exit (if you're willing to accept the responsibility), window or an aisle seat (if you like to drink a lot go for the aisle seat, so that you can easily go to the toilet). Force yourself to say howzit to the person sitting next to you - it's corteous, and will also open up the chance of a conversation with your neighbour. Attend to any computer work (take along a spare battery), and use the lowest battery use setup. Avoid watching movies before the flight, so that you're amped to watch when you are flying - movies kill a lot of time. Stretch before, after and as often as possible during the flight. Take along an eye mask - even if you're male you'll appreciate it. Ambient light on planes is one of the biggest reasons people struggle to sleep. Take along a tooth brush and face cloth, and stick as closely to your usual bed time routine as possible, to help you sleep. Maintain hygiene. Drink enough water to keep yourself hydrated - you'd be surprised at how dry the air is on these flights. Avoid sleeping pills or alcohol - these will make you feel worse at your destination. If the sleeping pills do work, you'll be stuck in the same awkward position for a long time, increasing the chances of DVT. Before you leave make a note of where the South African embassy is in the country you are going to, and understand how to get there - if there is civil unrest in the country, it's the safest spot for you to go to. 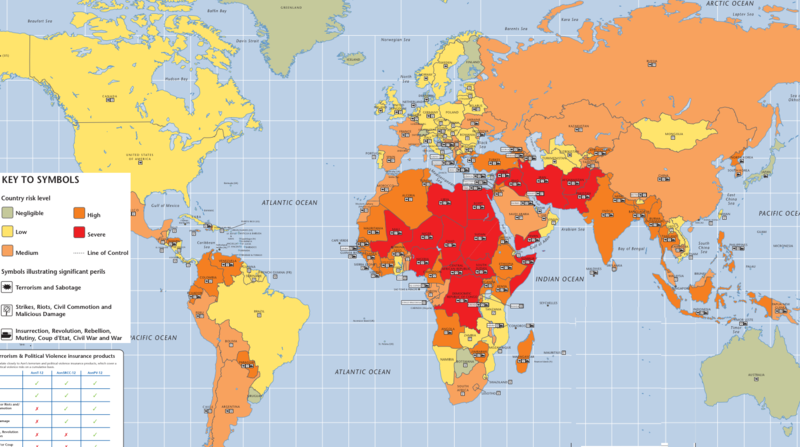 This map indicates the risk of terrorism and political violence in various countries. The safest countries to visit are Botswana, Japan, Australia, New Zealand, Denmark, Finland, Uruguay, Iceland, Switzerland, Trinidad & Tobago, Uruguay and Bahamas. Other goods to a total value not exceeding R5000, excluding consumables. The limit for airline crew members is R700. When travelling abroad be sure to register on ROSA (Registration of South African citizens Abroad), so that the Goernment can contract yourself or your friends/relatives if there's an emergency. For rugby navigate to KostazHDplus channel on Youtube - they upload the games about 2 hours after the match. UK Sky TV is good for watching live rugby & cricket. An increasing number of international travellers are taking laptops, smartphones & tablets with them overseas, and using data roaming services. It's a good idea to download a data usage app before flying out. Many travellers believe that a WhatsApp message is cheapest, but forget to take into account that whilst it only uses a kilobit of datab, the cellphone operators charge a minimum of 25 kilobits. Skype calls can also be very data hungry (even the background checks it carries out of which contacts are online), as can application updates (which often happen in the background) and downloading of attachments. Data roaming rates vary from country to country. Yoh! Well done on reading to the bottom - our statistics show you are the first person in the world ever to do so (jokes). We hope you have all the info you require now to book a cheap international flight (using the flight bookings tool on the top left of this page of course). If not, leave a question in the comments box below (in fact, leave a message anyway - we love to hear from our readers). When you do fly, please take lots of photos, and if you've got a chance email some to cheapflights@southafrica.to (another thing we love clients doing). Wishing you only blue skies and tailwinds. Ciao.